9780890420256 - Diagnostic and Statistical Manual of Mental Disorders DSM-IV-TR Fourth Edition (Text Revision) by American Psychiatric Association. American Psychiatric Association. Paperback. GOOD. Spine creases, wear to binding and pages from reading. May contain limited notes, underlining or highlighting that does affect the text. Possible ex library copy, thatâll have the markings and stickers associated from the library. Accessories such as CD, codes, toys, may not be included. American Psychiatric Publishing, 2000. Paperback. Acceptable. Disclaimer:A readable copy. All pages are intact, and the cover is intact. Pages can include considerable notes-in pen or highlighter-but the notes cannot obscure the text. At ThriftBooks, our motto is: Read More, Spend Less.Dust jacket quality is not guaranteed. American Psychiatric Publishing, 2000. Paperback. Good. Disclaimer:A copy that has been read, but remains in clean condition. All pages are intact, and the cover is intact. The spine may show signs of wear. Pages can include limited notes and highlighting, and the copy can include previous owner inscriptions. At ThriftBooks, our motto is: Read More, Spend Less.Dust jacket quality is not guaranteed. American Psychiatric Association. Used - Acceptable. All orders guaranteed and ship within 24 hours. Your purchase supports More Than Words, a nonprofit job training program for youth, empowering youth to take charge of their lives by taking charge of a business. American Psychiatric Association. Used - Good. Used - Good 4th May contain highlighting/underlining/notes/etc. May have used stickers on cover. Access codes and supplements are not guaranteed to be included with used books. Ships same or next day. Expedited shipping: 2-3 business days, Standard shipping: 4-14 business days. American Psychiatric Association. PAPERBACK. 0890420254 Has writing/highlighting. **Has staining** Acceptable Condition. Five star seller - Buy with confidence! . Fair. American Psychiatric Association. PAPERBACK. 0890420254 Good Condition. Five star seller - Buy with confidence! . Good. 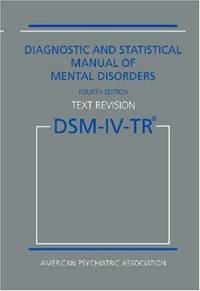 American Psychiatric Publishing, Inc. Used - Good. Shows some signs of wear, and may have some markings on the inside. American Psychiatric Publishing, Inc. Used - Very Good. Great condition for a used book! Minimal wear. American Psychiatric Publishing, June 2000. Trade Paperback . Used - Good. American Psychiatric Association. Used - Good. Good condition. 4th edition. Stamped on inside and top edge. American Psychiatric Association. Paperback. 0890420254 Unmarked text. . Good. 2000-06-01. 4th. American Psychiatric Association. PAPERBACK. 0890420254 Ships quickly. Mild to moderate wear. Spine is slightly creased; all pages tight and very clean. Slight indentations. Orphans Treasure Box sells books to raise money for orphans and vulnerable kids. . Good. American Psychiatric Association. PAPERBACK. 0890420254 Ships quickly. Mild to moderate shelf/reading wear. Orphans Treasure Box sells books to raise money for orphans and vulnerable kids. . Good. American Psychiatric Press Inc., 1994. This is an ex-library book and may have the usual library/used-book markings inside.This book has soft covers. With usual stamps and markings, In fair condition, suitable as a study copy. American Psychiatric Association, 2000-01-01. 4th. Paperback. Good. A few pages have underlining and highlighting. Cover shows some minor wear, mainly on the corners and edges. Binding is tight.We ship 6 days a week.